Papaya is an exotic fruit which is widely available throughout the year in India. Papaya fruits, papaya seeds and papaya leaves are loaded with medicinal benefits. There are a number of health benefits of papaya fruits, seeds and leaves – regulating blood sugar level to heal health, blood pressure and weight loss it helps you in many ways. Next time when you slice a papaya, make sure to not throw the seeds away because papaya seeds are edible and has medicinal properties too like the fruit itself. Today in this post, I am going to talk about various health benefits of papaya fruits, papaya seeds, papaya leaves. Native to South America, Papaya is grown across various countries including Brazil. According to the United Nations Food and Agricultural Organization, India is the largest producers of Papaya fruits. Indian farmers are producing over 5.5 millions of tons of Papaya out of total production of 12.4 million tons. India and Brazil are the two major producers of Papaya, producing over 57% of the total worldwide production of Papaya fruits. Papayas are the 4th most produced tropical fruits after banana, oranges and mangoes. Given the medicinal properties of papaya fruits, seeds and leaves, you can easily plant a tree in your backyard. Papayas plants are usually unbranched and straight and a properly grown female papaya trees can start producing papaya fruits, within three years. Papaya can be round and oval in shape, covered with thick skin, plum and seeds. A fully matured fruits can be anywhere between 500 gm to up to 1.5 Kg. Raw papayas are hard and has a greenish skin. As it ripe, it becomes softer, and the color of the skin changes from green to yellowish or amber. Due to its medicinal properties, papaya fruits and its seeds has many health benefits. A 100gm of Papaya fruits may provide 43 calories and lots of vitamin C (75% of the daily recommended value). Papayas taste great when it’s perfectly ripe. But if it’s over ripe, then it may not taste as good and it’s better to avoid eating such papaya. As you know, raw papayas are harder and green; the one that you should pick should be a little softer and yellowish or orange in color. If you are picking it from your own Papaya tree, then keep looking and once you notice the change in colour, maybe that’s the right time to harvest the fruit and keep it for a day or two. It will automatically get ripe and be ready to eat. Unless it is fully ripe, you should not store the papayas in the refrigerator. The best thing about papaya fruit is that you can just peal it off, remove seeds, slice it and eat. Ideally I prefer to eat Papayas in the morning because it tastes refreshingly good and keep me fuller for longer hours. But you may eat Papaya fruits during lunch meal. Apart from eating a plate full of papaya slice, sprinkled with sea salt, you may make smoothies, juice and even ice cream. When we talk about exotic fruits, we usually talk about eating it fresh, or making juices, smoothies etc. the best thing about papaya fruits is that you can eat both raw and ripe fruits. Raw papaya fruits can be eaten as a salad, or you can cook it and make a curry or stew. Papaya flowers can also be cooked and it used in many ways in Thai dishes. I am sure you like the taste of ripe papaya, but you can eat raw Papaya as well. And not only the fruits, Papaya seeds and Papaya leaves are also loaded with lots of health benefits that we are going to learn about in this post. So are you are ready to discover the health benefits of Papaya fruits, Papaya seeds and Papaya leaves? Consuming a well balanced diet including fresh fruits and vegetables has many health benefits. And papaya is definitely one of the super fruit worth eating. Possible health benefits of eating papaya fruits include curing heart disease, diabetes, and blood pressure, among many other lifestyle related diseases. Are you still thinking as to why is it necessary to eat papaya daily? Papaya fruits have antioxidant properties which help boost immunity. Papaya is a heart healthy fruit, because papayas are rich source of fiber contents that improves the digestive system and reduces bad cholesterol. Papaya has antioxidants zeaxanthin which creates a protective shield against the eye, preventing the harmful effects of UV rays. Papaya thus prevents macular degeneration. Papaya is rich in Vitamin K which strengthens bones in your body. Papaya also protects from arthritis and reduces stress. You have plenty of reasons to add papaya fruits to your diet; you can eat raw papaya fruits as salad or curry or eat the ripe one by just slicing the cubes. On top of that, it has various health benefits which make it a must to have in your diet. If you are on diet and wish to include fruits and veggies that can help you lose weight, then Papaya is necessary for you to have in your menu. 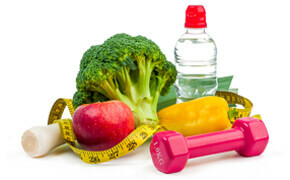 The basic principle of losing weight is to consume well balanced healthy meal which is not high in calories. A 100 gm serving of ripe papaya fruits contains only 43 calories and hence it’s the best fit for those who want to consume fewer calories. Due to dietary fiber contents, you will feel fuller for longer and hence it controls your hunger. Papaya fruits are great source of vitamin C and antioxidants which helps preventing the buildup of bad cholesterol in arteries. By including Papaya fruits in your regular diets, you can stop this buildup and reduce the level of bad cholesterol. Cholesterol can be deadly for your heart and it may cause heart attack. Risk of cardiovascular diseases can be possibly decreased by reducing the consumption of sodium intake and increasing the consumption of potassium intake. 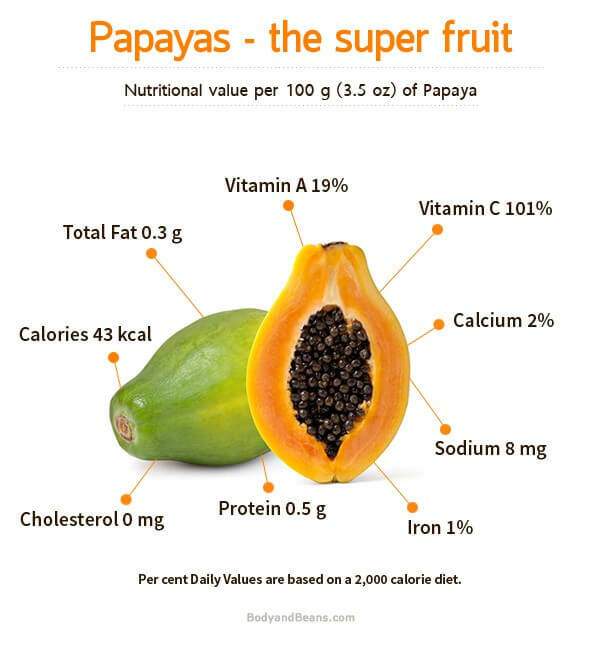 A standard 100 gm serving of papaya fruit contains 4% of potassium and only 1% of sodium (percent of daily recommended limit). And that makes is best for your heart. Stronger immune system can help you fight most common disorders. According to this report, consumption of Vitamin C was found to improve the human immune system. Papaya fruits are high source of Vitamin C. A 100 gm serving of ripe papaya fruits can fulfill the 75% of daily needed dose of Vitamin C, and that makes it a super fruit which is good great for immunity. Level of pollution is increasing globally and so are the cases of Asthma. But there are certain nutrients which lowers the risk of developing asthma. Beta-carotene is one such nutrient. Papayas are good source of beta-carotene. Eating fruits which are rich in beta-carotene like papaya, broccoli, apricots, carrots etc can lower the risk of asthma. As you know, ripe papayas have good content of antioxidants like Vitamin C, Vitamin E and beta-carotene. These antioxidants can help you protect your skin from aging and wrinkles. Pulp of the papaya fruits can be used to make face pack. Pulp of the papaya fruits contain an enzyme called papain which helps in breaking dead skin cells and promote skin renewals. Because of low contents of Sodium, papaya fruits can keep your skin hydrated for long and that’s just great if you have dry skin. Raw papaya paste can be applied on your skin by finely grinding the pulp and leaving it for 15-20 minutes before washing. Due to high content of Vitamin A, Papaya fruits can be very beneficial for your hair. If you have thin hair or too dry and frizzy, eating Papaya fruits or consuming Papaya juice can improve the quality of the hair. Shampoo and conditioners available with Papaya extract, which claims better hair quality. You can also make a paste that can be applied on hair and scalp to improve the hair quality. The paste can be made by blending the raw papaya fruits (seeds extracted). Blend the papaya and add half a cup fresh yogurt and the paste is ready. Apply it softly on your hair and scalp, leave it for 10-15 minutes then apply shampoo and conditioner. Precaution: Different people have different types of skins and hair. Some people are allergic to raw papaya and hence be careful while applying it on skin or on hair. Papaya seeds are edible and it has many medicinal properties. Papaya seeds are black in color and bitter in taste. But there are many health benefits of eating papaya fruits and hence it’s worth eating. You can wash, dry and grind the seeds to make it like a powder. The papaya seeds powder can be stored in a sealed glass container for reuse. You may consume the powder as it is, or may like to us it as salad dressing or mix lemon for taste. Papaya seeds may taste bitter, but it you just look at the health benefits of papaya seeds and ignore the taste, maybe it is better than the fruit itself. Dengue fever is viral fever caused by mosquitoes. Cases of dengue fever have grown dramatically across the globe. According to a report published by WHO, over 390 million of people get infected of dengue fever, every year. If we talk about cases of dengue fever in India, according to this report, published in The Indian Express, cases of dengue fever has just doubled in 2015. It’s seriously a global issue. Dengue fever may cause high fever, severe joint pain, headache, loss of appetite, vomiting etc. And there is no specific medicine available, except paracetamol for pain relief. 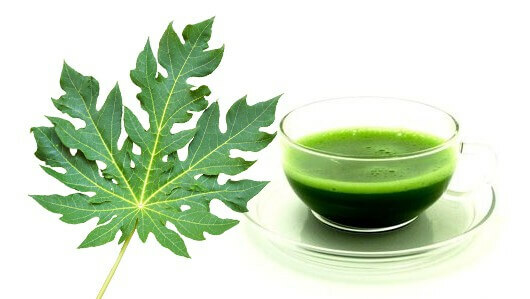 Even if there is no specific medicine available to treat dengue fever, the juice of papaya leaves is natural remedy for dengue fever. Dengue fever cause sudden drop in blood platelet counts. And the Papaya leave juice is an all natural remedy to increase the blood platelet counts and white cell counts. According to this study, by a Sri Lankan family Physician, taking juice of papaya leave actually increases the platelet counts and the total white cell counts within 24 hours. During the study trial, 12 patients were given the juice of papaya leaves, about 5 ml doses at an interval of 8 hours, twice. Blood samples were collected before consuming Papaya leaves and after 24 hours of consuming papaya leaves. And from the result it was evident that the count increased within 24 hours. How to make Papaya leaves juice? Making juice of papaya leaves is not complicated at all. Take a couple of not so matured or not too younger papaya leaves. Wash and rinse the leaves properly to get rid of dusts. Extract the leafy parts from the leaves by removing the stalks. And the fresh papaya leaves juice is ready to be consumed. According to Wikipedia, in some of the countries, they make tea out of papaya leave and consume it to treat malaria. Even if there is no clinical trial or study to prove this, but maybe it works? Raw papaya fruits releases a white and milky latex fluid. If you are cutting a raw papaya fruits and you are allergic, you may experience irritation. Not that, it causes irritation to all, but it may cause allergy. Eating Papaya fruits, seeds or juice may be harmful during pregnancy or breast feeding. Avoid eating the Papaya fruits, seeds or papaya juice in any form during pregnancy, breastfeeding or if you want to conceive a baby. Avoid excess consumption of papaya fruits, because it may cause carotemenia, because of the beta carotene that papayas contain. Papayas should be consumed moderately in any form. Papayas are a real exotic super fruit which is available throughout the year. Papayas are loaded with medicinal properties and possible health benefits of papaya fruits include weight loss, bad cholesterol control, immunity booster, heart health, skin and hair care. Like the papaya fruits, papaya seeds are edible as well and have many health benefits including detoxification of body, improving the digestion system, kills intestinal works in kids and much more. Juice or tea of Papaya leave can be used as a natural remedy for dengue fever and malaria. Eat it fresh by just slicing and sprinkling some sea salt, or make a smoothie and juice, papayas can be highly beneficial for your skin, hair and overall health. Do you eat papayas? I would like to know the benefits you got from eating Papaya fruits, papaya seeds or papaya leaves juice.